Dundee United say manager Jackie McNamara was pleased with their January transfer dealings despite the sale of two key midfielders to Celtic. 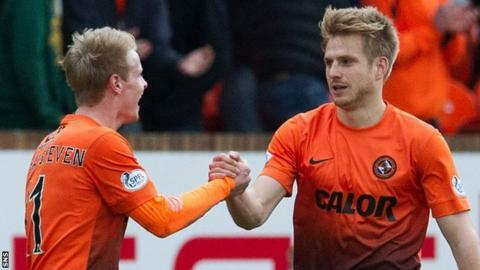 Stuart Armstrong and Gary Mackay-Steven and joined United's Scottish League Cup final opponents on Monday for £2m. It has resulted in some criticism from fans of the Scottish Premiership club. "The manager himself is happy with the result of this transfer window and fully supported the board's action," United said in a website statement. United stressed that, during January, they had signed "six new high-calibre" players. A statement said that Scot Paul Dixon, Estonian Henri Anier, Australian Ryan McGowan have all represented their countries. It added that Robbie Muirhead - signed late on Monday from Kilmarnock - is a Scotland Under-19 attacker; another striker, Simon Murray, has been scoring freely with Arbroath; while Nigeria Under-23 forward Ola Adeyemo has extended his contract. "Both Gary and Stuart made it clear that they wanted to leave Dundee United," United added. "When it was obvious that they both viewed their futures elsewhere, it is the board's responsibility to do the right thing for the club. "That then meant ensuring that the club realised optimum financial value for the players - one of whom had only 17 weeks left on his contract." Mackay-Steven had already signed an agreement to join Celtic in the summer when his Tannadice deal expired and the club had rejected offers from Celtic for the pair. English Premier League club Burnley also had a bid for Armstrong turned down. "It should also be appreciated that, in reality, players decide where they will play and not their current clubs," United said. "On this occasion, the lure of European football and increased personal financial reward and security are major draws to young players. "The transfer fees received will have the incidental effect of assisting the club to become completely debt free ahead of schedule." United insisted that the transfer dealings would not prevent them continue to "challenge on three fronts" - the Scottish Premiership, the Scottish Cup and League Cup. "We have some of the best players in the country and we have the best management team for attracting the best young talent," they added. "We trust in the manager, his coaching staff and the players as an entire squad."